Marie Irene Dyk was born on December 18, 1931, to Hubert and Grace (Verbrugge) Vander Lugt on a farm in Rock County, MN. She attended the Leota Christian School, Edgerton Christian School, and her last two years of high school at Western Christian School in Hull IA, from which she graduated in 1950. 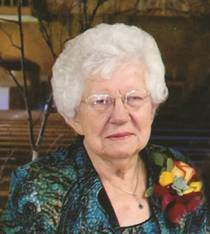 For most of her life, she was a member of the First Christian Reformed Church in Edgerton. It was there that she made public profession of her faith. After graduation she taught in New Holland Christian School in New Holland, SD. While teaching she met Henry Dyk whom she married on May 25, 1953. During the first years of their marriage, Henry and Marie owned a farm in Platte, SD. In 1972, they moved to a farm north of Edgerton. She was a homemaker and helped on the farm in any way needed. In 1984 they moved into Edgerton and then for several years she worked at the Edgerton Meat Market. On May 7, 2014, Henry preceded her in death. In 2015, she moved into the apartments at Edgebrook. About 2 weeks ago, she was admitted to Sanford in Sioux Falls, SD, and a week ago entered into Sanford Luverne Hospice Cottage where she passed away on Wednesday, December 27, 2017 at the age of 86 years and nine days. Marie spent her spare time working volunteer jobs she enjoyed doing, including: serving hot lunch at school, quilting with Jennie Van Essen, working at the thrift store, delivering Meals on Wheels and church bulletins. She enjoyed doing fancy work, reading, playing Scrabble, crossword puzzles, word search, attending Bible studies in her church, and having coffee with friends. Marie is survived by her children, Gordon (Ila Jean) of Luverne, Rose (Dave) Pucci of Grand Rapids, Michigan, Greg (Kay) of New Era, Michigan, and Roxann (Tim) Bossenbroek of Champaign, Illinois; 10 grandchildren, 5 great-grandchildren; brothers, Peter Vander Lugt of Edgerton, and James (Nathalee) Vander Lugt of Edgerton, John (Joanne) Vander Lugt of Hudsonville, Michigan, and sister Dorothy (Daryl) Baar of Sioux Falls, South Dakota. She was preceded in death by her husband, Henry; her parents; two sisters, Hannah Wieberdink and Alma De Vries.